The grid is a network that connects electric power generation plants to high voltage lines which carry electricity over some distance to substations - "transmission". When a destination is reached, the substations decrease the voltage for "distribution" to medium voltage lines and then further to low voltage lines. Finally, a transformer on a telephone pole reduces it to a household voltage of 120 volts. See the diagram below. The overall grid can be thought of as composed of three major sections: generation (plants and step up transformers), transmission (lines and transformers operating above 100,000 volts - 100kv) and distribution (lines and transformers under 100kv). Transmission lines operate at extremely high voltages 138,000 volts (138kv) to 765,000 volts (765kv). 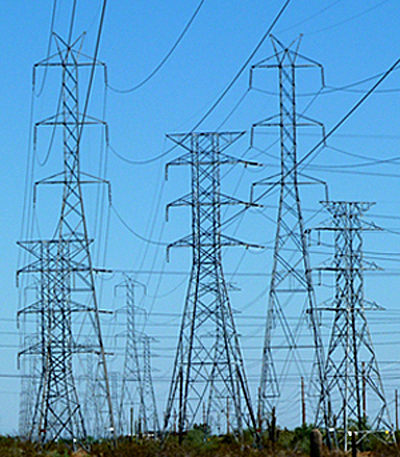 Transmission lines can be very long - across state lines and even country lines. 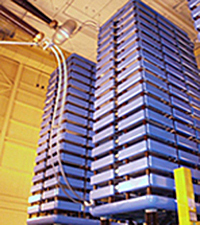 For the longer lines, more efficient high voltages are used. For example, if the voltage is doubled, the current is cut in half for the same amount of power being transmitted. Line transmission losses are proportional to the square of the current, so long line "losses" are cut by a factor of four if the voltage is doubled. "Distribution" lines are localized across cities and surrounding areas and fan out in a radial tree-like fashion. This tree-like structure grows outward from a substation, but for reliability purposes, it usually contains at least one unused backup connection to a nearby substation. This connection can be quickly enabled in case of an emergency so that a substation's territory can be fed by an alternative substation. 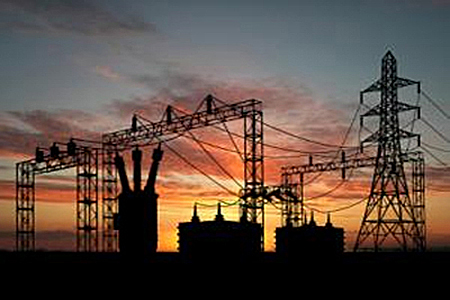 For back up purposes, transmission lines run in parallel and are interconnected with other transmission systems. In the US there are three major interconnected grid systems: those east of the Rocky Mountains, those west of the rocky mountains, and the state of Texas. However, back up is a two way street. 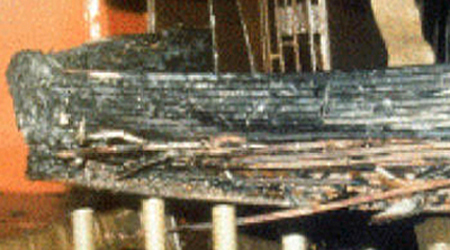 A catastrophic failure in one part of the grid can bring down a substantial section of the interconnected grid as happened in 2003 when a tree in Ohio brought down the grid all the way to New York City and parts of Canada. Since then operational improvements have been incorporated that hopefully will prevent another large domino-effect. In the grid system, electricity is used in real time as it is generated. That is, energy is being generated and used simultaneously in the same amounts. Supply and demand on the grid must always be in balance. There is almost no ability to store electricity. Also, it is difficult for the grid to accommodate large, rapid changes in either load or generation. Obviously the load fluctuates quite a bit - both daily and seasonally. However, with many cities connected together, small fluctuations tend to cancel each other out. The aggregate demand normally behaves in a relatively predictable manner. Based on the day of the year from historical data and current weather forecasts, a next-day "load forecast" is usually made by noon of the previous day. A minute by minute schedule is put together for the generating plant and is adjusted in real time as the day progresses. Very skilled operators monitor the actual load and make minute by minute adjustments. They also carefully watch for any unusual happenings and are trained to act accordingly. 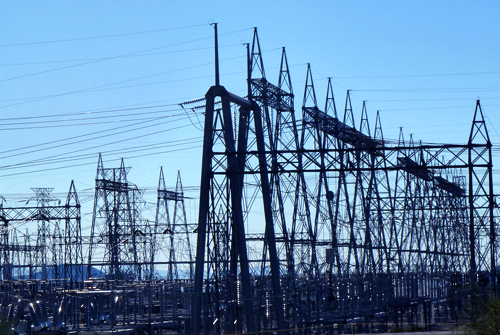 There are many visions of what a "smart grid" is. Consumers think of a smart grid as one where they have some intelligent influence over how much electricity they buy. Professionals in the utility industry think a smart grid is one that can react to sudden changes. Transmission - networks including power generating plants over which power moves in bulk over medium and long distances. The networks are actively managed, power can move in both directions, and the transmission voltages are over 100 kv (kilo-volts). Distribution - local networks that traditionally moved power in one direction (towards customers). However, with the advent of customer generated rooftop power (or small wind farms), these networks are becoming bi-directional. Power lines operate under 100kv. High speed sensors called Phasor Measurement Units (PMUs) sample voltage and current many times a second at a given location providing a detailed picture of the power system. Phasors create representations of the various grid waveforms of alternating current, which ideally in real time are identical everywhere on the network and conform to the most desirable shape. With visibility over a wide geographical area, phasors can ease congestion and bottlenecks, and can even mitigate large blackouts. In the current grid, measurements are taken once every 2 or 4 seconds and are not synchronized across the system. Equipped with modern "integrated communication" links, phasor measurements are precisely time synchronized and taken 30 times per second. Clock pulses from GPS satellites are used to obtain precision time synchronized measurements over the covered area offering dynamic visibility into the system. Research suggests that "wide area" PMU systems will revolutionize grid management by rapidly responding to negative system conditions (including terror attacks and blackouts). 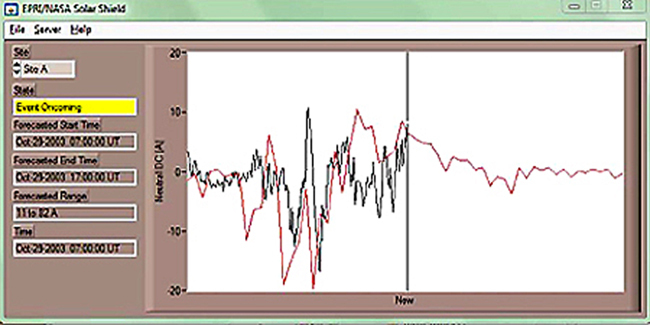 When an "abnormal" grid waveform is detected, it indicates that something is amiss. In 2006, President Bush and the Department Of Energy (DOE) proposed that by 2030, the US should obtain 20% of its electricity from wind power. In 2009 wind accounted for only about 2% of the electricity in the US. Electricity generated by wind is highly variable, both on an hourly basis and seasonally. People think of July and August as the trying times for the grid, but those hot days are quite predicable. It turns out that April and October are the worst months from a management point of view as the wind fluctuations are quite large. During winter the wind is rather strong and steady. During summer wind is weak and unchanging. When the wind suddenly begins to blow, a power surge is encountered on the grid. Likewise when wind suddenly dies, there is a large power drop. 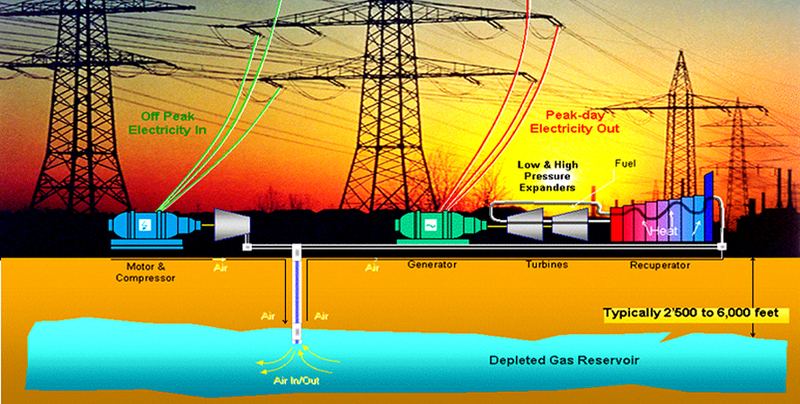 If the wind suddenly dies, the load normally has to be taken up by combined cycle gas plants. Because these plants take considerable time to power up, they must be run in "spinning standby", i.e. running but not producing any electricity. Normally grid operators have several generators in standby mode in case of a system failure somewhere on the grid. When wind is only 2% of the supply, variability is not a problem as 2% can be easily covered by existing standby capacity (normally 5%). As wind approaches 20% or more of total capacity, managing the variability becomes much more serious as much more capacity must be kept spinning or alternative back up arrangements must be made with adjacent providers. 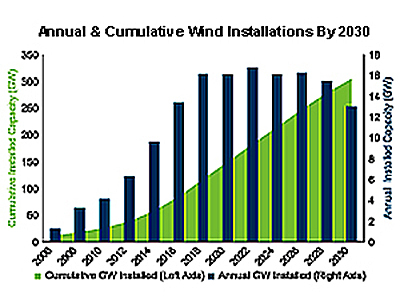 In the past few years there have been two major studies of this problem - the Eastern (US) Wind Integration and Transmission Study (EWITS) and the Western Wind and Solar Integration Study (WWSIS). Both of these studies were multi-year efforts consisting of huge simulations using real wind data streams, prices of fuel, and actual placements of wind installations and fossil fuel generators. Both studies re-affirmed that 20% penetration of electricity demand by wind is technically feasible with minor improvements in current practices. Penetration of 30% requires new transmission lines to be built and much more careful forecasting of wind conditions down to the 10 minute interval level. 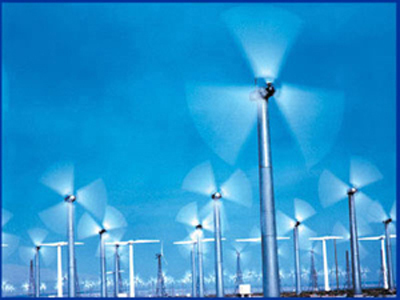 At 30% penetration, electricity operating costs would be reduced by approximately 40% as wind requires very little fuel. A smart transmission grid must be able to redirect power across different transmission lines depending on load conditions. For example, there are two major transmission lines that deliver power from Quebec, Canada to New York City. One that goes through Albany is highly congested and overloaded. The other which flows through the Catskill Mountains is under utilized. The world's most sophisticated high-power controller, which was installed by Siemens at the Marcy, New York substation, automatically pumps power from one transmission line to the other as required. Intelligent high voltage controllers use very large "thyristor valves" (shown at the left) to switch mega-watts of power. Intelligent substations employing smart power controllers added to existing transmission grids to redirect power loads in and around congested areas would eliminate the need for terra-watts of new power generators through better efficiency of existing lines. The total load connected to the grid can vary significantly over time. Although the total load is the sum of many individual choices of clients, the overall load is many times not a stable, slow varying, power curve. As mentioned above, generation can vary greatly from renewable resources due to rapid reductions in wind generation or cloud cover for solar. A temporary solution for this type of event is to automatically ask large business users to temporarily cut back their usage in return for an overall price reduction in their total usage. With two-way communications and intelligent controllers, this can and is being done with some large companies in California. Consumer electronics devices now consume over half the power in a typical US home. Other key devices that consume a lot of electricity include air conditioning units, electric water heaters, electric heating devices, pool pumps and other high wattage devices. A "consumer grid" would connect all these devices to a simple programmable two-way meter (similar to an ATM machine) connected to the local grid. A smart "distribution grid" would then incorporate customer programmable meters and could anticipate at least some customer behavior. This enables customers to better control “intelligent equipment” and “smart appliances” in businesses and homes enabling them to better manage their purchase of electricity and reduce their energy costs. 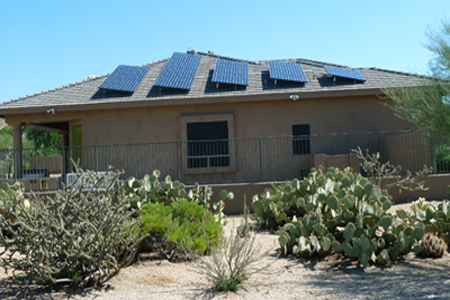 Although residential customers have been installing solar systems for several years, the total of these installations is very small in the overall market amounting to only one or two percent of total residential electricity. However, as more and more states offer incentives to go solar and as more utilities are forced to obtain more electricity from "distributed sources", this is going to change the character of "grid distribution". Today, the effect of distributed generation is so small that utilities basically ignore it in their day to day operations, except to install bi-directional meters for electricity credit purposes. As distributed generation becomes more prevalent the "distribution grid" will become a two-way grid instead of a one-way grid. This will mean "distribution" utilities will have to actively manage their grids similar to what "transmission" companies have to do today. The fluctuations of solar electricity generation due to rapid cloud cover disturbances will cause headaches to distribution utilities just like it does today with transmission utilities. The smart distribution grid of tomorrow will have to be actively managed by very competent technicians. A survey sought the opinions of 1,900 households and small businesses from the U.S., Germany, Netherlands, England, Japan and Australia. Among the findings, almost two-thirds of the customers are interested in generating some of their own electricity provided they can sell power back to the utility. In the next five years vast amounts of renewable sources of electricity will be coming on line. One of the major problems with renewable energy, such as wind or sun, is that they are "time-of-day" dependent. Wind is primarily a night time event and the sun is a daytime event. In addition they are rather unpredictable at times. Wind can suddenly die down and clouds moving in can block a good portion of the sun. But... electricity is needed all 24 hours of the day. Today, these disturbances are solved with back up live, but idle generators, which are an expensive solution. Tomorrow, the solution would be to store some electricity for times when these disturbances occur. Unfortunately, there is not a really good way of storing lots of electricity. 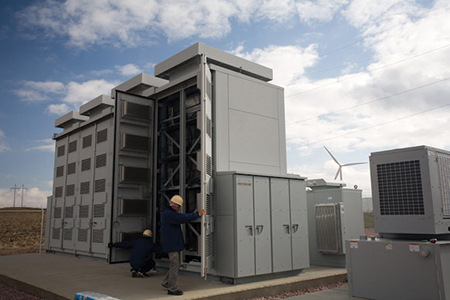 Batteries can store relatively small amounts of electricity, but not yet on a utility scale. See the picture at the left of a experimental battery for a wind installation. While electricity is not storable, energy is. Molten salt, heated from the sun, can store energy up to eight hours. But, the best way to currently store mass amounts of energy is Compressed Air Energy Storage. The sun periodically emits a Prominence on its surface, a distinctive looking figure that is in its outer atmosphere, the Corona, and many times has a swirl or loop configuration. A Prominence is a mass of plasma gases and charged particles that are cooler (60,000 degrees C) than their surroundings (a million degrees C). 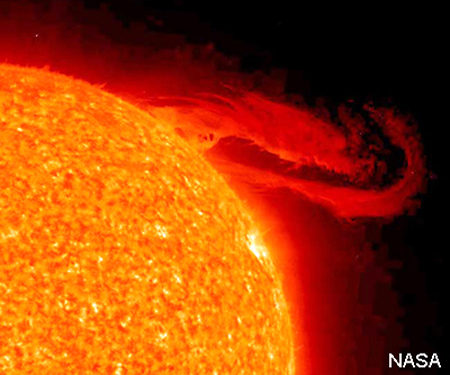 A typical Prominence is a billion tons or more of these gases supported by huge magnetic forces. Some Prominences break apart and morph into Coronal Mass Ejections (CMEs) that are propelled into outer space at a million miles per hour. The CME on the left erupted from the sun during September, 2008. Solar Flares can also morph into CMEs. And, some CMEs form on their own without either Flares or Prominences. The relationship between Prominences, Flares and CMEs is not well understood. In addition, they are not predictable as the trigger mechanisms are also not understood. Considering that the sun itself is rotating, a small number of CMEs have a trajectory that will intersect the earth in its orbit around the sun. These earth directed CMEs are called "Solar Storms". Shown at the left below is an actual animation of the sun and surrounding space from March 14, 2011 to March 27, 2011. In the middle is the sun with the earth the yellow circle at 0 degrees on the right. The sweeping yellow and green swaths are the normal bursts of plasma particles from the sun that we call the solar wind. Their circular motion results from the rotation of the sun which is roughly every 27 days. There is a CME on March 18th that is a strong one (colors red, purple and black) but it flies off to the southwest and is in no danger of hitting the earth. When the magnetic field of a CME interacts with earth's magnetic field, there is an induced magnetic reaction. If the CME is a mild one, as most are, we see the reaction as a strong aurora in the skies near the north pole which we would term an extended "northern lights" show. However, during severe Solar Storms, enormous amounts of energy are transferred to earth's Magnetosphere through a process called Magnetic Reconnection. Huge "Geo-magnetically Induced Currents" (GICs) are produced which run through the earth's crust surface and then upwards through the "grounding" wires of the grid. Magnetic Reconnection is a physical process in the highly conductive gases of the upper atmosphere when magnetic fields clash and then restructure themselves into a lower energy level configuration. The excess magnetic energy is converted into electrical currents in the ground and the grid. Thus, our power grids have become giant antennas for GICs. These massive currents can melt giant grid transformers. This actually happened in 1989 damaging transformers in New Jersey at a nuclear power plant (shown on the left below) and Canada. These huge transformers can take up to a year to repair or replace. Although the above storms did some local damage, relatively speaking the damage was contained and not widespread. About once every 500 years, a humongous CME can hit the earth. One such storm hit in 1859, known as the Carrington Storm, named after Richard Carrington, a prominent English astronomer who observed it. It was the first Solar Storm ever recorded. Stunning auroras pulsated as far south as Cuba, El Salvador, and Hawaii. Telegraph systems worldwide went haywire. Spark discharges shocked telegraph operators and set the telegraph paper on fire. If such a disastrous monster storm should hit today, experts tell us that the grid damage would be devastating - the equivalent of 20 times Katrina. Consumer electricity on a wide scale could be shut down for months. It is hard to imagine all the consequences of such an event. In addition to grid transformers, satellites are also subject to Solar Storms. There are over 900 operating satellites in space and all are vulnerable to Solar Storms, especially communications satellites. SWPC - In the United States, the main source of space weather information is the Space Weather Prediction Center (SWPC) located in Boulder, Colorado. SWPC is the service center of the National Oceanic and Atmospheric Administration’s (NOAA's) National Weather Service. The SWPC provides forecasting information for solar storms and also monitors events once a storm hits the earth's atmosphere. SWPC scientists incorporate satellite based sensor data, as well as data from optical observatories around the world. SWPC forecasts space weather on time scales of hours to days by analyzing current conditions, comparing current conditions to past conditions, and using forecasting models. Solar Shield is a solar storm forecasting system for the North American power grid developed by NASA and EPRI (Electric Power Research Institute) to forecast solar storms with enough warning to give utilities time to react. The goal of the project is to develop a forecasting system that can help mitigate damages from GIC currents on high voltage transmission systems. Solar Shield uses mathematical models based on data retrieved from space satellite readings from the sun's flare explosions and from earth-orbit satellite based sensors as the storms pass by. The first calculation is whether or not a fast flying solar storm is likely to intersect the moving earth in its orbit around the sun. The size, speed, timing, strength and exact direction of the storm are also critical first estimates. Most storms just fly off into outer space, only 1% affect the earth. 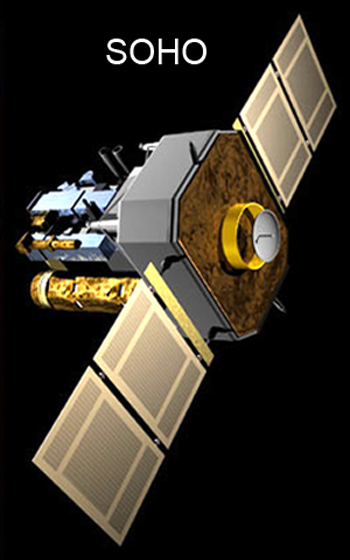 SWPC uses several satellites to monitor solar events. Launched in 1995, SOHO, shown at the left, currently operates at the L1 Lagrange Point, which is the point between the sun and the earth where the gravitational pull from the two bodies counter balance about 1 million miles from earth. There are a total of 5 Lagrange Points (L1 through L5). SOHO's mission is to study the sun from deep in its core to the outer Corona. SOHO provides "magnetograms" and CME observations on the sun's surface which are used for the two day SWPC forecasts. Originally intended to operate for only two years, it has greatly exceeded its life expectation and is currently approved to operate through the end of 2012. 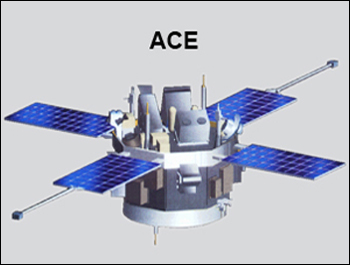 Launched in 1997 ACE, pictured at the left, also currently operates close to the L1 Lagrange Point. 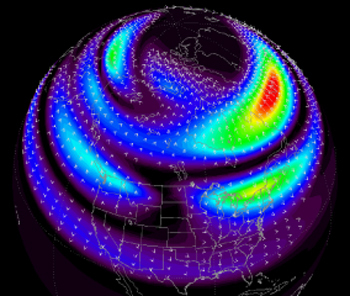 Its mission is to study energetic particles from the solar wind and storms as they pass by. It has sufficient propellant to operate until approximately 2024. Over time these satellites drift and periodically they must be re-positioned at the L1 Lagrange Point using stored fuel. However ACE's instruments are now outdated and the government is attempting to get funding for a replacement satellite called DSCOVR. 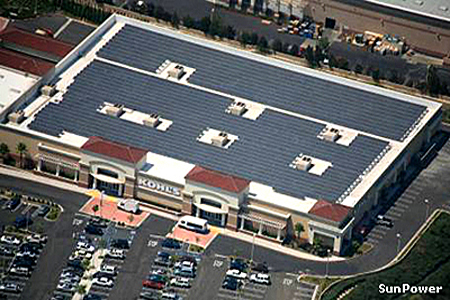 Solar Shield is divided into two sections - Level 1 and Lever 2. Using input from SOHO as the storm leaves the sun, the Level 1 software produces a three dimensional model of the CME and then predicts when it will strike the earth, if at all. Level 1.makes a probabilistic forecast of specific nodes (transformers) of the grid that are likely to be affected by GICs one to two days in advance. Level 2 makes a deterministic forecast of affected transformers using ACE measured data as the storm passes the L1 Lagrange Point an hour or so before the storm hits the earth's magnetosphere. Level 1 makes a probabilistic forecast of specific nodes (transformers) of the grid that are likely to be affected by GICs one to two days in advance. Level 2 makes a deterministic forecast of affected transformers using ACE measured data as the storm passes the L1 Lagrange Point an hour or so before the storm hits the earth's magnetosphere. ACE will measure the actual CME's speed, density and magnetic field. Since the storm travels approximately one million miles per hour and ACE is about one million miles away, the lead time of the forecast is only 40 to 60 minutes. But, this is enough time for grid system operators to take some types of action. Both of these computer forecasts are fed into the SWPC center as well as into EPRI's Sunburst Network. The map at the left shows GIC ground current directions (small arrows) and intensity (by color, red is most intense) from a storm of April 5th, 1998. SWPC categorizes solar storms on a K-scale that ranges from 1 to 9. The actual index used is an average of a number of monitoring points. When the SWPC forecasts a storm greater than Kp 6, operators swing into action. The chart at the left is an actual Solar Shield screen in the middle of a solar storm. The left hand side shows the Level 1 Solar Shield four data fields (forecasted start time, forecasted end time, range of currents, and the time stamp of the forecast). The graphic on the right of the screen shows how the Level 2 forecast compares to the observed GIC up to the “now” line, and then shows the forecast only to the right. As one can see, although the timing is slightly off, the DC neutral current "range", which is of the most interest, is almost bang on. Restore out-of-service transmission lines if possible. Reduce loading on high voltage transmission lines to 90% of normal. Bring standby generators on line. Monitor key lines and transformers with increased vigilance. Increase "reactive" reserves (generators, capacitor banks, static VAR compensators, etc.). Reduce and maintain system voltages in acceptable ranges. Decrease loading on susceptible transformers if possible. Re-dispatch electrical generation if possible. As a last resort, remove affected transmission equipment from service if excessive GICs are measured or unusual equipment behavior is experienced. In 2011 NOAA inaugurated a computer model, called WSA-Enlil that can predict when a CME will hit earth plus or minus six hours - twice as accurate as the previous forecast models. The new model combines two advanced models, the Wang-Sheeley-Arge (WSA) and Enlil (the Sumerian god of the wind) into a space weather forecast. These linked models simulate phenomena from the base of the sun’s corona out into interplanetary space to earth and other nearby planets. Space weather scientists “inject” solar events observed by satellites into the WSA-Enlil model to forecast how the space storm system is likely to unfold. The forecast is updated every two hours. Shown at the left is a computer screen displaying a forecast. These charts can be seen live daily at the Space Weather Prediction Center (SWPC) web site from Boulder, CO. The top row plots show predictions of the solar wind density. The bottom row plots show solar wind velocity. The circular plots on the left are a view from above the north pole of the sun and earth, as if looking down from above. The sun is the yellow dot in the center and the earth is the green dot on the right. Also shown are the locations of the two NASA STEREO satellites. The wedge-shaped plots in the center provide a side view, with north at the top and south at the bottom. The graphs on the right show the model predictions over time for the plasma density and velocity at the earth and the two STEREO spacecraft. The yellow vertical line is in sync with the animations on the left, so it is possible to see how values of density and velocity correspond to various solar wind conditions. 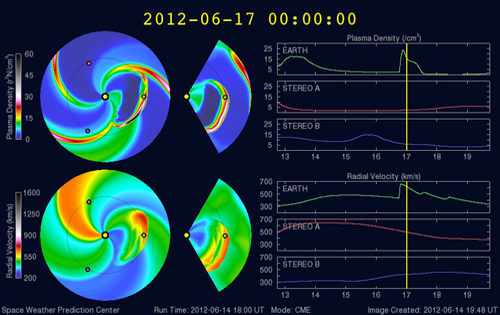 In this particular forecast a small CME can be seen striking the earth at about 12 am on June 17, 2012 (my birthday).